There is one peculiarity appertaining to matters referring to living things, namely an impossibility to construct a perfect definition. For instance, taking the word spore, we use it freely, and understand fairly well what we mean when we use it, but although in most instances we may accurately define any particular spore, we cannot construct a definition to include all spores. A spore is a free protoplast enclosed in a cellulose case. Then there are spores which have no case, for instance, the megaspore of a flower. A spore may not be free as in the compound spores of many Fungi. Again, there are many single free protoplasts which are not spores. A spore is a single protoplast which is employed in the function of propagation or reproduction, yet there are other things, such as gemmae, with a similar function, which we do not call spores. Spore production we may trace in the highest to almost the lowest of plant forms. A simple form of spore production is that with which we are familiar in the case of ferns and mosses. Sacks are formed full of little spores. When ripe the sack bursts, and the spores are blown about by the wind. 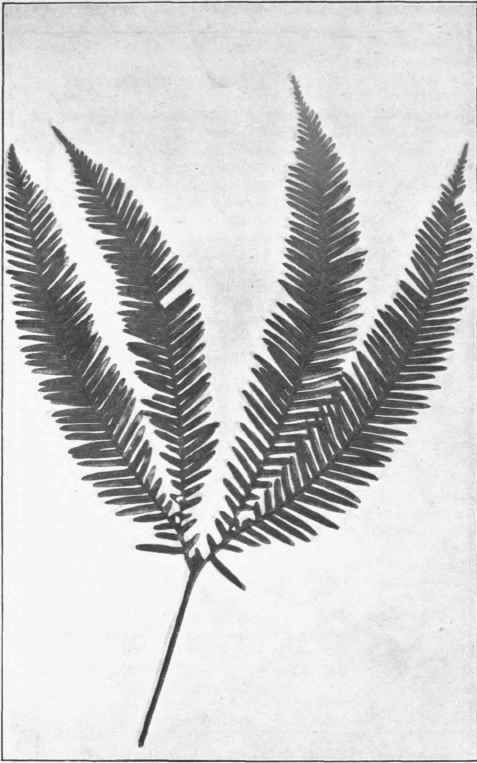 In ferns, the spore sacks may be seen like fine brown dust in clusters on the back or margin of the leaf. In mosses the spores are contained in single large case3, commonly referred to as the moss-fruit. In both these instances the spores are all of one size. In several distinct instances dame Nature has bethought herself that economy may be effected by producing spores of two sizes; large or megaspores of a passive nature, and small or microspores whose duty it is to fertilise the others. This is the condition we find in many lowly plants, and likewise in Firtrees and Flowering plants. In the latter the microspores are formed in the anthers, and the megaspores in the pistil. In the case of an ordinary fern the spores do not grow into young fern plants, but into quite a different form. The spore on germination grows into a small, flat, green, heart-shaped plant, called a prothallium. On the under-surface of this the essential organs of reproduction develop; fertilisation takes place, and a young fern plant is the result. Thus a fern has a dual existence, one generation only developing spores, and the other the organs of reproduction. This is called the Alternation of Generations. In the Fir tribe there are both micro and megaspores; the former dusty, and very like the spores of ferns, the latter are larger, and formed on the bracts of the cones. The megaspores are not shed, but each develops a minute prothallium within the spore; on this is developed the germ which will be fertilised by a microspore, and will then grow into an embryo or seed of the Fir. In flowering plants the same takes place, only the prothallium is reduced to a few obscure cells. So in these instances the spore-producing generation is the important one, and the reproducing generation is insignificant. In mosses the reverse is the case. 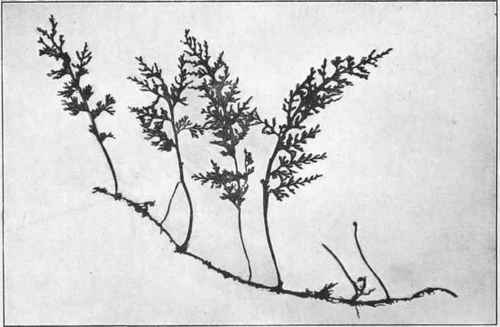 The Moss-plant develops the organs of reproduction, fertilisation takes place, and the embryo develops into a single spore-producing case, which is generally on a tall stalk, and lives permanently attached to, and deriving its nourishment from, the mother plant, and is called its fruit. In the days of old but little interest was taken in the study of plants, though a greatly exaggerated idea of medicinal properties gave work to primitive physicians known as herbalists. Those who pursued them had to confine their studies to external characters because they had little means of seeing further. With the advent of the microscope this was changed, and earnest students soon took advantage of this instrument to unravel the mysteries that existed beneath the surface. One of the first things noted was that when a transverse section of a plant-stem was made, the appearance it assumed had somewhat that of a minute honeycomb. It seemed to be made up of small chambers. These were filled with fluid, but that received no attention, and the plant was considered to be made up of these chambers which had the ability of growing and multiplying. As the spaces in a honeycomb were called cells so these spaces in the plant tissue received the same name. Even to the present day the name has survived for the ultimate structure of plants and animals, though its meaning has long since passed away. In the fullness of time it was discovered that the cell-walls were simply non-living cases, and the viscid fluid contained was the true living substance. We know now that this viscid fluid is a highly complex material compounded of hundreds of atoms of some ten different elements, whose constant change is the physical basis of what we understand as life. It has received the name of Protoplasm. We know that Protoplasm in the mass does not act as the living material, but that it consists of minute bodies each of which acts as an independent living being. Unfortunately the name cell got to be extended to these bodies, which are not like cells at all. It is better to call them Protoplasts. All plants and animals are built up by these protoplasts. These little beings are like workmen who build a house, the cell-wall is the structure built mainly of a substance called cellulose, the contained living being is the builder, and he builds to an inherited plan. A protoplast is not a simple mass of protoplasm, but consists of definite parts. There is a nucleus which appears to exercise control, also many more or less specially shaped bodies which do work in constructing material, some are green, others coloured or colourless. They all have their duties, and they, together with the nucleus, are embedded in a portion of protoplasm which is given the special name of Cytoplasm.